Don’t let the inconvenience of a cast stop you from carrying out your normal day-to-day routines with our line of cast protectors. 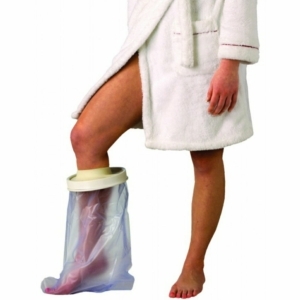 Here at Millercare we have a range of waterproof cast protectors that will enable you to shower and bathe with ease with these affordable and comfortable protectors that simply slip on and off. At just £12.49 (excluding VAT) these guards won’t break the bank but will certainly provide you with ease of mind when you’re cleaning yourself. These will help to keep your cast dry, avoiding the uncomfortable itching and the odour that a wet cast can cause. The different sizes ensure that there is something to help cover every type of cast, from legs, arms, hands and wrists; so you’re bound to find the right one for you without unnecessary extra cover as well. Shop the line below and find the product right for you and your cast. 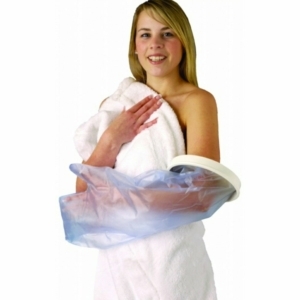 Comfortable and waterproof, these cast protectors are just what you need if you’ve had an accident and have your arm or leg covered in plaster. 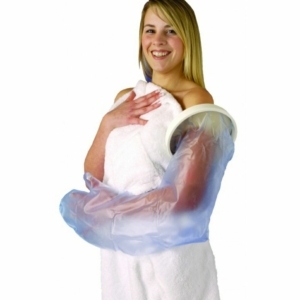 These handy covers are reusable and ensure that you can bathe and shower with ease and comfort. 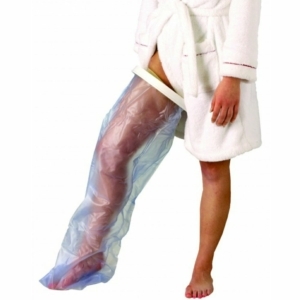 No hanging your arm or leg out of the bath with these wrappings. It’s important to keep your cast dry because most of them are easily damaged by water. This will reduce their rigidity and requires another time-wasting trip to the hospital to have it replaced. These range of waterproof cast covers save a lot of time and they’re extremely easy to get on and off. You can use them again and again and it’s important to note that they’re intended for single patient use only. You want to avoid getting your cast wet because it may not hold the bone in place that you’re trying to fix because the cast could start to dissolve in the water and it could also irritate the skin underneath it, possibly leading to infection. Available in a range of different sizes, these waterproof cast protectors are designed for people of different heights and they’re specifically tailored to whether you have your cast on your arm, wrist, ankle or full leg. This helps ensure you have the right product for your specific needs. They’re all priced at £12.49 excluding VAT as well. Simply slip your arm, leg, hand or foot into the cover and rest easy knowing that the watertight covering will keep the area arid. Purchasing one of these items will certainly provide some relief, as you avoid having to deal with annoying bands, plastic bags and other homemade solutions that very well may leak. Although cast protectors will help protect your cast from getting wet, it’s important that they’re not used for swimming, and even when in the bath or shower you still need to avoid submerging your cast. With these protective and waterproof covers you can rest easy knowing that you cast and skin will stay clean and dry; allowing your skin to stay dry guarantees that you’re far less prone to infection and ensures that your body continues the bone-healing process uninterrupted. Shop the line now at Millercare or come and see us instore. Find the nearest branch to you with our handy brand locater tool.